Cachexia is a syndrome characterized by unintentional weight loss, progressive muscle wasting, and a loss of appetite, and is thought to be directly responsible for 20 percent of cancer deaths in the United States. It is far too common, being present in at least 50 percent of people with advanced cancer. In addition to weight loss and muscle wasting, symptoms usually include a lower quality of life. Cachexia is diagnosed by looking at a combination of body mass index (a calculation based on height and weight), lean muscle mass, and blood tests. Since cachexia is thought to often be present even before weight loss occurs, a high index of suspicion is important in recognizing the condition as soon as possible. A number of treatment approaches have been evaluated ranging from diet, to dietary supplements, to medications, but can be challenging as cachexia is more than just a lack of calories in the body. Newer research suggests that exercise, though counterintuitive, may help. and compounds such as one type of omega-3-fatty acid (fish oil) have shown promise in reducing the complications of the condition. Cachexia is sometimes referred to as a paraneoplastic syndrome, which simply means symptoms that are caused by substances made by cancer or by the body's reaction to cancer. Cachexia not only worsens survival for people with cancer, but it interferes with quality of life. People with cachexia are less able to tolerate treatments, such as chemotherapy, and often have more side effects. 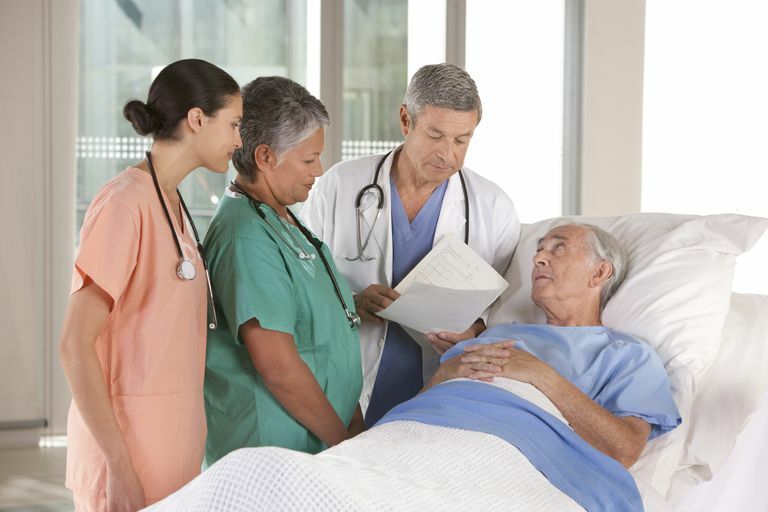 For those who have surgery, postoperative complications are more common. Cachexia also worsens cancer fatigue, one of the most annoying symptoms of cancer. Involuntary (unintentional) weight loss: Weight loss with cachexia is involuntary, meaning that it occurs without trying. Yet it goes further than unexplained weight loss. Weight loss may occur even though you are getting an adequate amount of calories in your diet, and if calorie intake outweighs output of energy. Unintentional weight loss is defined as the loss of 5 percent of body weight over a 6 month to 12 month period, but even smaller amounts of weight loss could be of concern. Skeletal muscle wasting: Muscle wasting is a hallmark of cachexia and occurs along with a loss of fat. It can also be fairly insidious. In people who are overweight at the time of their diagnosis, significant loss of muscle mass can occur without an obvious outward appearance of weight loss. Anorexia/loss of appetite: Loss of appetite is another symptom of cachexia, and again, this symptom is somewhat different than ordinary "loss of appetite" symptoms. With cachexia, it is not simply a decreased desire for food, but more of a loss of a desire to eat. Lowered quality of life: Muscle wasting can diminish your ability to walk and participate in activities that would ordinarily be enjoyable. Cachexia may be caused by "tumor factors," substances manufactured and secreted by a tumor, or by the "host response." Host response simply means the body's response to a tumor. The response of the immune system to cancer and other causes of cachexia is being studied to try and understand the underlying factors behind cachexia. Cachexia is dominated by catabolic metabolism. If you think of normal metabolism being the building of tissue and muscle (anabolic metabolism), the opposite is true with cachexia, which is the breakdown of normal bodily processes. Cachexia is seen frequently with cancer but is also seen with diseases such as AIDS/HIV, heart failure, emphysema, and kidney failure. With regard to cancer, it is seen most frequently with lung cancer, pancreatic cancer, and stomach cancer, but may be seen with any type of advanced cancer. Even though the symptoms and signs of cachexia are usually noticed late in the course of cancer, we're learning that the process leading to muscle wasting begins very early on after a diagnosis of cancer. In such, cachexia is often present before any weight loss occurs. Body mass index (BMI): Body mass index describes not only relative body weight but can give more information about a healthy weight. BMI is calculated using a formula of height and weight. Lean muscle mass: Measuring body composition can help determine the ratio of lean muscle mass to body fat. Tests used to do this may include skin folds and bioimpedance. Food intake diaries: Keeping a food diary is an important activity when looking to prevent or cope with cachexia. At the same time, it's important to keep in mind that the malnutrition of cachexia can occur even with an adequate intake of calories. Blood tests: Some lab tests that are useful in evaluating cachexia include white blood cell counts (WBC), serum albumin, transferrin levels, uric acid, and inflammatory markers, such as C-reactive protein (CRP). Diet: Contrary to what may seem obvious, replacing and supplementing calories in the diet has not made a big difference in the syndrome of cachexia. That said, it's very important to make sure that people coping with cancer (and similar conditions that cause cachexia) have a healthy diet. One important point to keep in mind is that if someone has not been eating much for a period of time, intake should be increased gradually. If calories are pushed too rapidly, a side effect called "overfeeding syndrome" may occur. When eating is not possible (or is limited) orally, a feeding tube may be recommended. Nutritional supplements: It's ideal if nutrients can be obtained through food, but we know that's not always the case. Fish oil has been evaluated for its ability to treat cachexia with some studies (but not all) suggesting it may be helpful. In one study, adding a powder supplement of eicosapentaenoic acid (EPA), one of the main three omega-3 fatty acids that people get in their diets by eating fish, improved the levels of inflammatory markers that go along with cachexia. Supplements of EPA were also linked with shorter hospital stays and fewer infections and complications. Exercise: It may seem counterintuitive, but increasing activity (if possible) may help. An obvious benefit of exercise is increased appetite, but endurance training may go beyond eating habits to help slow the decline in muscle mass seen with cachexia. Medical marijuana and Marinol: Thus far the evidence for the use of cannabis for cancer-related cachexia-anorexia is equivocal. Hopefully, with changes in regulations leading to a greater ability to study substances such as THC and CBD in clinical trials, the question of their efficacy will be answered. Several medications are currently in clinical trials that show promise in helping people cope with the symptoms of cachexia. A few of these are now in phase 3 trials, experimental studies that evaluate a drug or procedure that has already been deemed relatively safe and effective. For now, and given the fact that cachexia often begins long before it is obvious on physical exam, it's important to address this complication in people with conditions such as lung cancer as soon as possible after a diagnosis. As with so many issues regarding cancer, it's important to be your own advocate in your care. Studies tell us that cachexia in cancer is an unmet need, and that screening for and treatment of cachexia varies widely around the country. If you are living with cancer, and especially if you have experienced a loss of appetite or any weight loss, talk to your doctor about cachexia. While intake of calories isn't the whole answer in preventing or treating cachexia, it does play a role. If you are struggling with your appetite, talking with an oncology nutritionist may help. If you have symptoms that are limiting your ability to eat, such as shortness of breath, difficulty swallowing, or more, talk to your doctor. Sometimes working with a palliative care team can be invaluable in addressing the annoying symptoms related to cancer and cancer treatments, allowing people to live their best life possible with this disease. Blum, D., and F. Strasser. Cachexia assessment tools. Current Opinions in Supportive and Palliative Care. 2011. 5(4):350-5. Bonsaeus, I. Nutritional support in multimodal therapy for cancer cachexia. Supportive Care in Cancer. 2008. 16(5):447-51. Elia, M. et al. Enteral (Oral or Tube Administration) Nutritional Support and Eicosapentaenoic Acid in Patients With Cancer: A Systematic Review. International Journal of Oncology. 2006. 28(1):5-23. Fearon, K. et al. Definition and Classification of Cancer Cachexia: an International Consensus. Lancet Oncology. 2011. 12(5):489-95. Dodson, S. et al. Muscle Wasting in Cancer Cachexia: Clinical Implications, Diagnosis, and Emerging Treatment Strategies. Annual Review of Medicine. 2011. 62:265-79. Kumar, N. et al. Cancer Cachexia: Traditional Therapies and Novel Molecular Mechanism-based Approaches to Treatment. Current Options in Oncology 2010. 11(3-4):107-17. Lira, F. et al. Regulation of Inflammation in the Adipose Tissue in Cancer Cachexia: Effect of Exercise. Cell Biochemistry and Function. 2009. 27(2):71-5. Madeddu, C. et al. Randomized phase III clinical trial of a combined treatment with carnitine + celecoxib ± megestrol acetate for patients with cancer-related anorexia/cachexia syndrome. Clinical Nutrition. 2011 Oct 31. (Epub ahead of print). Maddocks, M. et al. Improving muscle mass and function in cachexia: non-drug approaches. Current Opinions in Supportive and Palliative Care. 2011. 5(4):361-4. Mantovani, G. et al. Randomized phase III clinical trial of five different arms of treatment in 332 patients with cancer cachexia. Oncologist. 2010. 15(2):200-11. Murphy, R. et al. Influence of eicosapentaenoic acid supplementation on lean body mass in cancer cachexia. British Journal of Cancer. 2011. 105(10):1469-73. Op den Kamp, C. et al. Pre-cachexia in patients with stages I-III non-small cell lung cancer: Systemic inflammation and functional impairment without activation of skeletal muscle ubiquitin proteasome system. Lung Cancer. 2012. 76(1):112-7. Martin, L., and C. Kubrak. How Much Does Reduced Food Intake Contribute to Cancer-Associated Weight Loss. 2018 Aug 18. (Epub ahead of print). What Could Cause Shoulder Blade Pain? What Does it Mean if You Have Pancytopenia? What is Superior Vena Cava (SVC) Syndrome? Should You Take Vitamins and Minerals During Cancer Treatment? What Can You Do About Loss of Appetite With Cancer? How Can Bronchorrhea Be Managed Along With Lung Cancer? Should You Be Concerned by Unexplained Weight Loss? What Could Be Causing Pain on the Right Side of Your Chest?